Over the past eight years, the United States has experienced a remarkable explosion of innovation and entrepreneurship in clean energy. 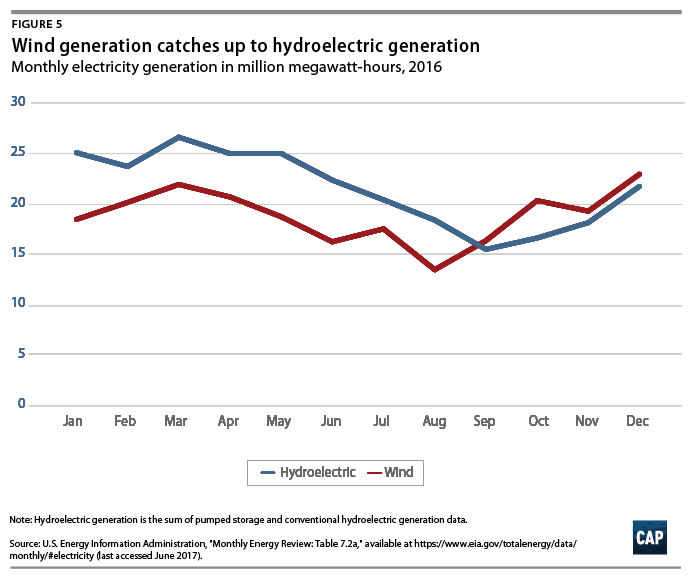 The U.S. energy sector has steadily transformed to a cleaner one with electricity production from wind quadrupling and utility-scale solar electric generation increasing 40-fold. Throughout this transformation, the energy sector has maintained affordability and reliability and supported clean energy jobs for millions of Americans. The clean energy sector will continue to build on this foundation, given the powerful forces of technological innovation, ever-lower costs, and broad business and public support that have coalesced around clean energy. Since taking office, however, President Donald Trump and his administration have set in motion numerous efforts to dismantle the clean energy growth engine. The Trump administration’s budget, for example, starves support for continued clean-energy innovation and its regulatory agenda undermines energy efficiency initiatives and repeals or rewrites critical air and water protections to favor fossil fuel production and interests. Moreover, President Trump has abandoned efforts to reduce carbon emissions—most notably by announcing the withdrawal of the United States from the Paris climate agreement. Between 2008 and 2016, renewable energy grew significantly, led by increases in wind power. 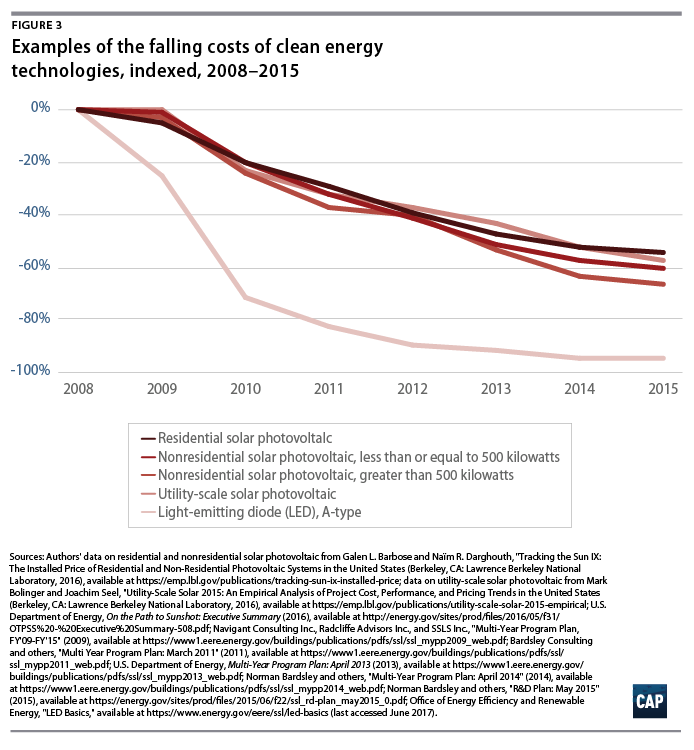 The combination of significant past investments by industry and the federal government with these more recent investments and policy initiatives has greatly lowered the costs of deploying key clean energy technologies.17 This has created what is termed a virtuous cycle where falling costs have spurred additional deployment, which in turn has led to further economies of scale and cost reductions from accumulated experience in the deployment of these technologies. Since the construction of wind-power generation continues to grow at a strong pace, while the number of large hydroelectric power facilities is not increasing, wind power can be expected to surpass hydroelectric power in terms of annual generation of electricity in the near future. 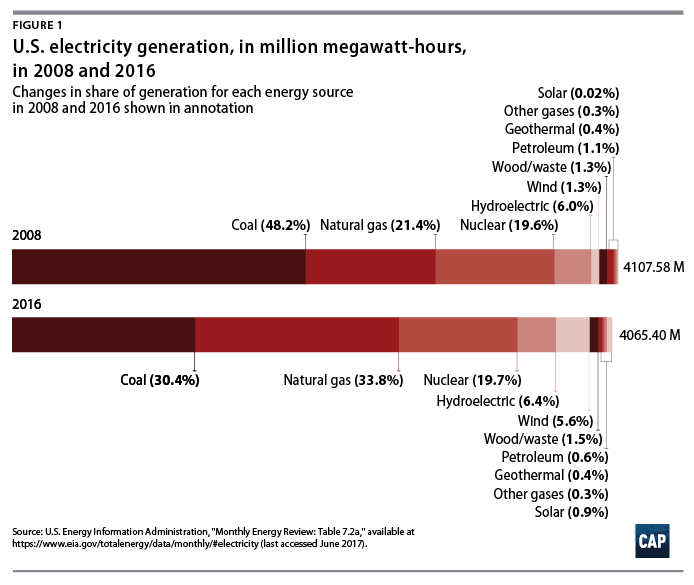 Solar electric power generation in utility-scale systems—which are larger than most rooftop and distributed solar systems—grew more than 40-fold from 2008 to 2016, from 864 thousand megawatt-hours to 36,754 thousand megawatt-hours.21 Within this overall 40-fold growth in utility-scale solar is an even more striking development. Before the Obama administration, there were no photovoltaic (PV) solar plants greater than 100 megawatts operating in the United States.22 In 2008, total utility-scale solar PV generation was only 76 thousand megawatt-hours.23 The DOE Loan Programs Office helped finance the first five large PV generating facilities. 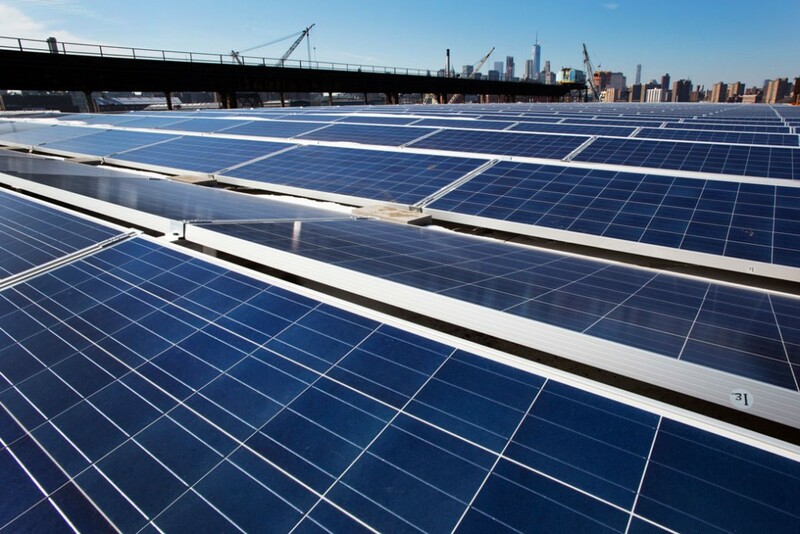 After these facilities demonstrated the technology and helped the financial community understand the low level of risk, the private sector built another 45 large PV generation projects on its own.24 In 2016, utility-scale solar PV generation reached 33,367 thousand megawatt-hours, or 33.4 million megawatt-hours,25 a 440-fold increase over the level generated in 2008. Smaller, distributed solar electric power generation systems also have grown strongly in recent years. 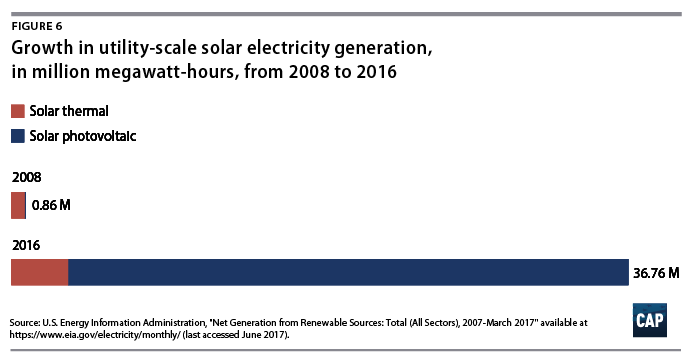 Growth for distributed solar from 2014 to 2016 has been significant: EIA estimates more than 70 percent growth from 11.2 million megawatt-hours in 2014 to about 19.5 million megawatt-hours in 2016.26 The combined total of EIA’s figures for solar electricity generation from utility-scale and smaller scale facilities in 2016—56.2 million megawatt-hours—is just above the level of wind power generation in 2008. As solar electric generation technology continues to drop in cost, there is great promise for continued growth in the utilization of this clean energy resource. 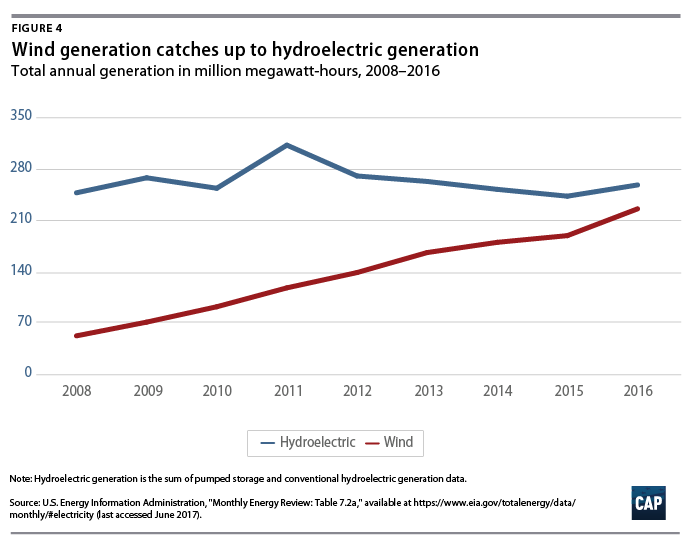 The trends in the U.S. electricity generation mix from 2008 to 2016 have had a significant effect on carbon dioxide, or CO2, emissions from this sector. 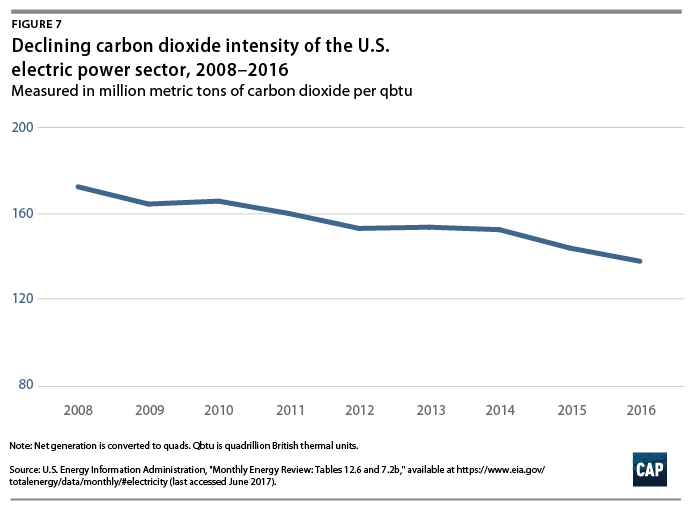 Over the past eight years, CO2 emissions in the electric power sector have dropped by 23 percent, from 2,373 million metric tons in 2008 to 1,821 million metric tons in 2016.27 This decline in emissions is impressive, because electricity production varied up and down only slightly during the same time: From 2008 to 2016 overall, net generation in the electric power sector declined by only 1.4 percent, from 3,974 million megawatt-hours to 3,920 million megawatt-hours.28 This means that the carbon dioxide intensity of the electric power sector, that is to say, the amount of carbon dioxide emitted per unit of net electricity generation, declined by more than 22 percent. The growth of clean energy and energy efficiency not only saved consumers money and improved the environmental performance of the energy sector, it also created new jobs. Federal labor data categorization makes it difficult to account for clean energy jobs accurately prior to 2010. 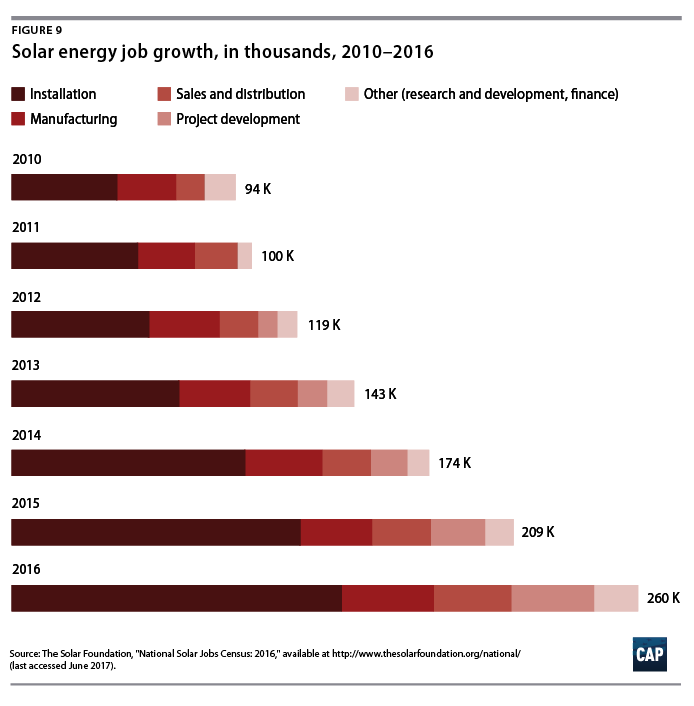 For example, the data identifies residential solar installation establishments as electrical contractors, not solar companies.44 Starting in 2010, nonprofits began charting clean energy job creation more accurately, followed by the DOE’s 2016 and 2017 editions of the U.S. Energy and Employment Report. Wind power represents the third-largest category of clean energy jobs and accounts for slightly more than 77,000 workers in 2015 and nearly 102,000 workers in 2016, a 32 percent increase in employment in one year.49 The American Wind Energy Association reported a 20 percent increase in employment from 2014 to 2015.50 Like the solar sector, the largest share of employment in wind generation of electricity is in construction. 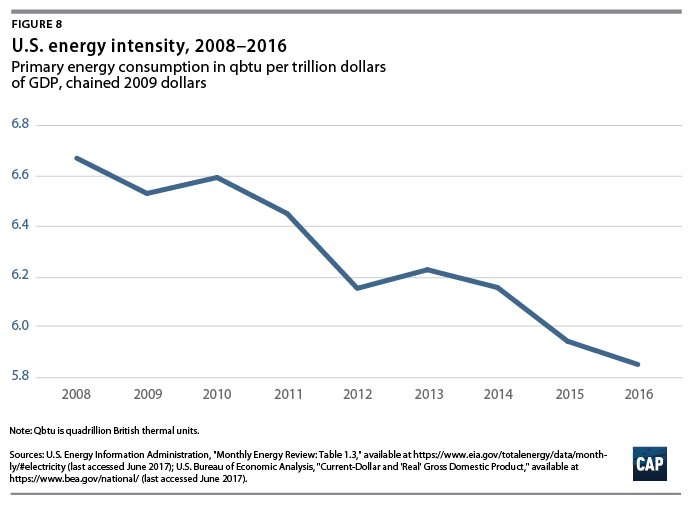 A common thread among all three of these segments of the clean energy industry is that their employment growth in recent years has greatly outpaced the growth rate of all nonfarm U.S. employment, which increased by 2.21 percent from January 2014 to January 2015, and by 1.85 percent from January 2015 to January 2016.51 The effective mixture of policies and financial incentives under the Obama administration has helped make clean energy a bright spot in the overall U.S. economy. Robert M. Simon is the former principal advisor to the director for energy, transportation, and resources in the White House Office of Science and Technology Policy and a former staff director of the U.S. Senate Committee on Energy and Natural Resources. David J. Hayes is a senior fellow at the Center for American Progress and the former deputy secretary of the U.S. Department of the Interior. 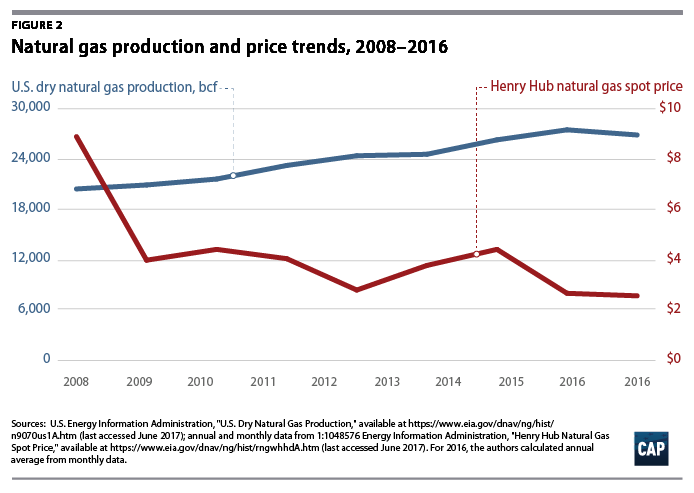 Luke Bassett, the associate director of domestic energy and environment policy at the Center, contributed to editing this issue brief.